200 pages | 9 B/W Illus. 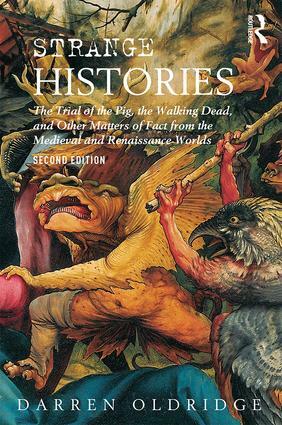 Strange Histories is an exploration of some of the most extraordinary beliefs that existed in the late Middle Ages through to the end of the seventeenth century. Presenting serious accounts of the appearance of angels and demons, sea monsters and dragons within European and North American history, this book moves away from "present-centred thinking" and instead places such events firmly within their social and cultural context. By doing so, it offers a new way of understanding the world in which dragons and witches were fact rather than fiction, and presents these riveting phenomena as part of an entirely rational thought process for the time in which they existed. This new edition has been fully updated in light of recent research. It contains a new guide to further reading as well as a selection of pictures that bring its themes to life. From ghosts to witches, to pigs on trial for murder, the book uses a range of different case studies to provide fascinating insights into the world-view of a vanished age. It is essential reading for all students of early modern history. Darren Oldridge is Professor of Early Modern History at the University of Worcester, UK. He has published extensively on religion and belief in the period. His other books include The Supernatural in Tudor and Stuart England (2016) and, as editor, The Witchcraft Reader (2nd ed. 2008).